I decided to dedicate our next DIY post to mobiles. There are so many cute ones flying around and you can either buy them from sites like etsy.com or you can make them yourself! So, here are some of the best tutorials I have found online and I hope you enjoy. This is the first mobile I remembered seeing when I first found out I was expecting. 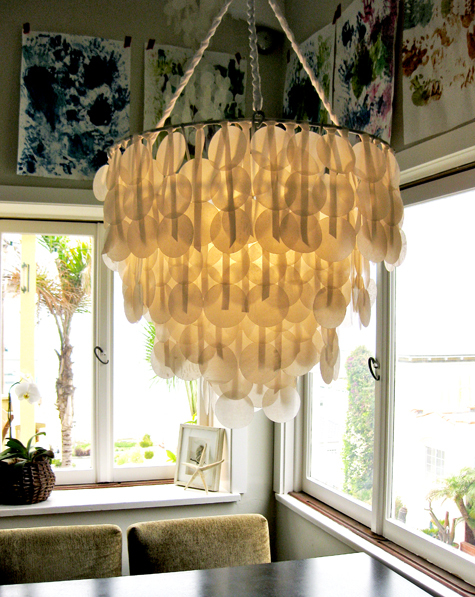 It very simple and untraditional, making it the focal point of a room. Lucky for us the folks over at spool give us a tutorial and free patterns to accomplish this at home. I used to sell kirby vacuums and we had these circular cotton pads that look very similar to the ones in this pictures. My first thought was o.O really? Then I got to looking at this mobile and decided it was very pretty. So I found a tutorial for it and Brenna gives a great tutorial over here. 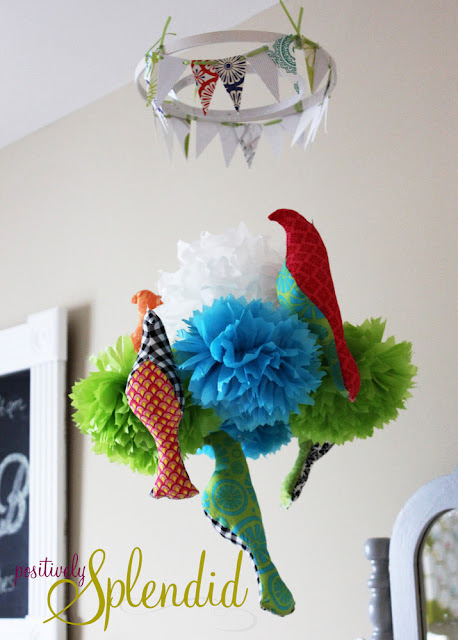 I have seen these little pom pom mobiles everywhere. Positively Splendid makes a tutorial using Martha Stewart’s method of making the pom poms. 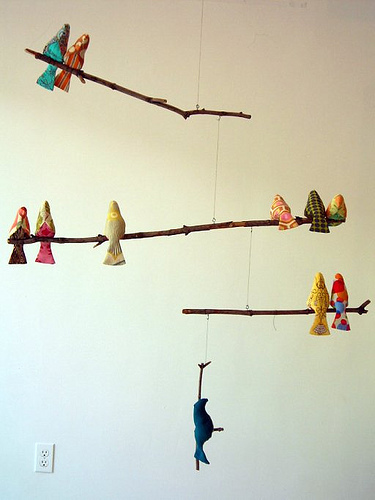 You can replace the birds with anything and I think hanging the pom poms individually from the ceiling and throwing in some stars or maybe some adorable elephants, would make this the perfect mobile for any nursery. Right now one of the biggest fads are owls. They come in so many different colors,shapes and sizes they can be used for almost anything. 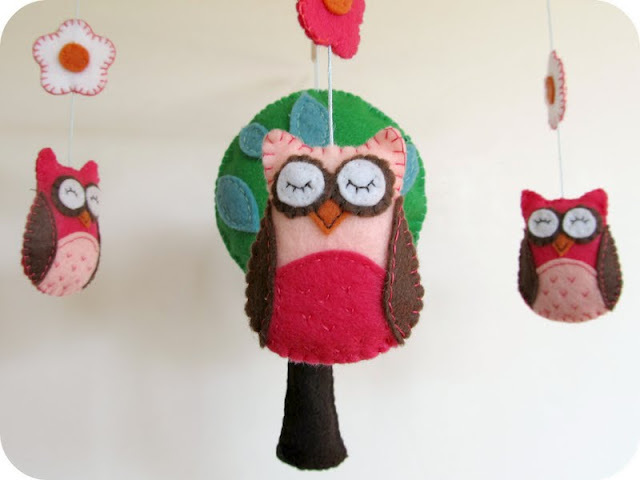 Homemade by Jill gives a tutorials and template on how to make this adorable mobile. I have spent way too much time away now. I haven’t updated in a month and I don’t even know how to begin blogging again. I told myself when I started this blog that I would update at least once a weak. I would provide readers with fun things to do, all while documenting my son’s and my life. I want to be able to show him this years from now and say “look mom did this when you were born!” I have neglected that. So, I am going to give you guys an update on what been going on. Two days later he started crawl. Not full out crawling, that would come the next day. He would get on all four and pull his knees into his belly and then launch himself into a belly flop. He would does this continuously until he reached where he wanted to go. We laughed and took pictures, thinking it would be a couple of weeks until he succeeded. No, not a couple of weeks, at all. The next day he started all out crawling and ever since then he has not stopped. Before you can even put him on the floor his little arms and legs start kicking out and as soon as he makes contact he is off. You can look up for 10 seconds and he is not even in the room anymore. It’d time to invest in baby gates! 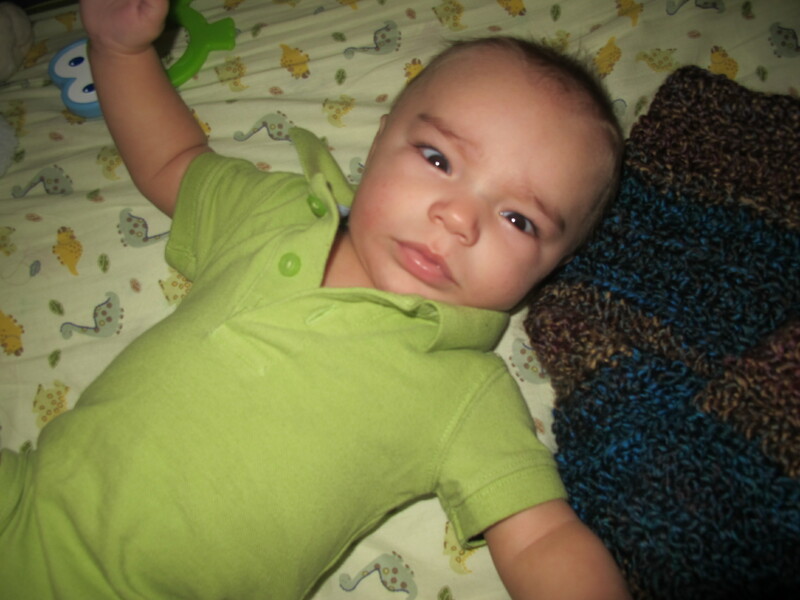 Two weeks later….he is pulling himself up. His crib, the coffee table, the couch, your leg, the dog, boxes, cabinets. Anything he can get his little grip on is no longer safe. Pretty soon he will be standing and then walking. If his quick progress hasn’t show how fast he learns, I don’t know what will. We move from sunny Florida to sunny California in 16 days. We have found out that because the military hires someone to come moves us and holds that company liable for any lost or damaged good, the moving company won’t let us pack anything. Everything that we have packed will only be gone through and repacked. So, I am not sitting in a house that is fully unpacked and feeling as though I have not accomplished anything. On one hand I am grateful that I don’t have to pack, load the u-haul and then drive three days to California. It is still very frustrating that I cannot do anything. off. So I would have plenty of time, douche. This is what has been going on in our lives. It’s been hectic and a little unnerving but we are getting through it. I will have another post for you soon. Thanks to those who keep coming back. I feel as though I will never have time to make another post because of trips to Tennessee, visiting grandparents, packing for the upcoming move to California and the fact that, as much as I hate it, Ryker is growing up and becoming more active. My computer is broken and I hate using this wordpress app. My six month old is demanding more attention, more playing and is providing less naps and silent moments to do the things needed to be done. I enjoy every minute of it though. Every crying, babbling, drooling, diaper rash and smiling second of it. It is hard though. I haven’t touched my sewing machine since the shoe incident and my baby blanket is far from finished. I’m frumpy on good days and tired on most but in the end everything will get done. If only because it has to. It will be done. Ryker had his 4 month appointment today and it went wonderfully. He weighed 15 ibs 14 oz and was 26 1/2 inches long. So, he was average in size but he is 5 months in a couple of days and is already sitting up by himself and rolling over and over and over. He can’t crawl so he has figure out how to roll where he wants to go. He is having baby conversations with you as if you can truly understand what he is saying and responds to his name. He is just getting too big too fast, in a couple of months he will be walking and talking and I won’t know what to do with myself. He recently discovered he has feet so now that is his new obsession. He is becoming more and more of a joy each day and I am always surprised at how much he is growing each day. I believe that being a mother is the greatest joy there is. What was I thinking? I can’t sew and I have no patience, Why didn’t you guys just tell me to leave it alone? I finally sat down and figured out how to put my sewing machine together and started making shoes! If that’s what you would call them…..it. Okay, I confess. I made ONE shoe and it came out horribly. 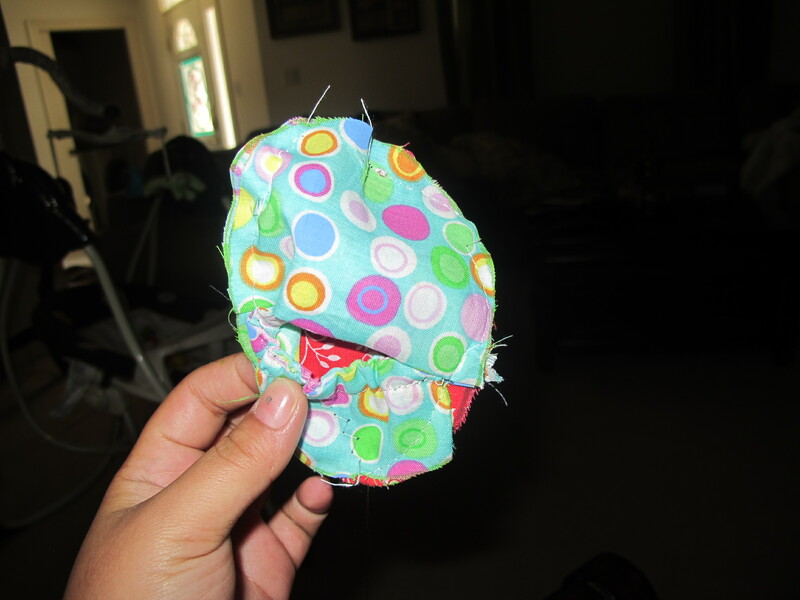 A yard of fabric and two spools of thread later….one shoe. So here are some pictures of my one shoe. But…. On a cuter note, here a picture of Ryker in his adorable polo onesie after a nap. My sewing machine came in yesterday! I can start sewing adorable baby shoes, bibs and burp clothes. If only I could figure out how to put it together, it comes with instruction but its basically like reading Pig Latin. Who can understand that crap? After I figure out how to put it together, I have to figure how to work it!!!! This should be fun. Wish me luck. If you were to ask me what I cannot leave the house without, as a mother, it would definitely be burp cloths. 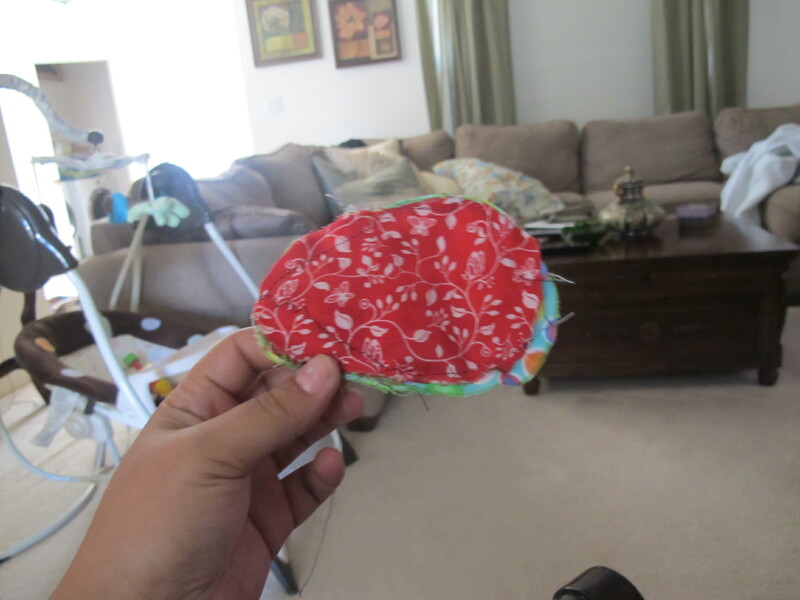 So i searched the entire interweb just to bring you these easy to make burp cloth tutorials. Of course these tutorials are going to be very similar but you can always improv to make it work a little better for you. Prudent Baby has my personal favorite tutorial but you can choose from any of the below for inspiration. Click photos for links to tutorials and sites. Running With Scissors has an awesome tutorial on how to make these fun adorable tails. Your little one can run to their heart’s content and be a dinosaur themselves. RAWR! I found this while searching for some projects to do when my new sewing machine came in. I thought it was adorable enough to post it. It features a garden where children can pick their own fruits and vegetables, an apple tree with pickable apples, windows and an adorable dog with a doggy door. The mailbox is also usable and the door opens and closes. This make a perfect gift or playtoy for your babies. These crayon molds are sure to make coloring more fun. Remember all those broken crayons your little one won’t use? Throw them all in a mold and pop them in the oven. Whether you decide to do single colors or multiple colors per mold this cute craft is sure to make your little artist want to help make these. Okay, how adorable is this? Too adorable! If you just so happen to be a flipping awesome mom or dad why not build a coffee shop for your little one? Unfortunately there isn’t a tutorial but the link provided gives you different picture so that you can kind of figure it out. You definitely need to be creative for this one. Well we got orders to 29 Palms, California. I can’t say that I am excited to be in the middle of the Mojave desert with camel spiders, sand lice, cacti, scorpions or any of the other oddities that reside there. However, I can say that I am okay with the fact that we will be two hours from San Diego and Los Angeles and three hours from Vegas. So, we start packing and moving our family and life to yet another state in June. I’m not going to miss Pensacola, it’s just too big for my liking. I’m a country girl and my soul longs for dirt roads, no stop lights, mudding and fishing. It’s only for a year though so I can hope for Tennessee the following year. I ordered a new sewing machine today and I am literally doing cartwheels waiting for it to get here. I’m ready to start making some adorable shoes, burp cloths, bibs and clothes!. EEEK. 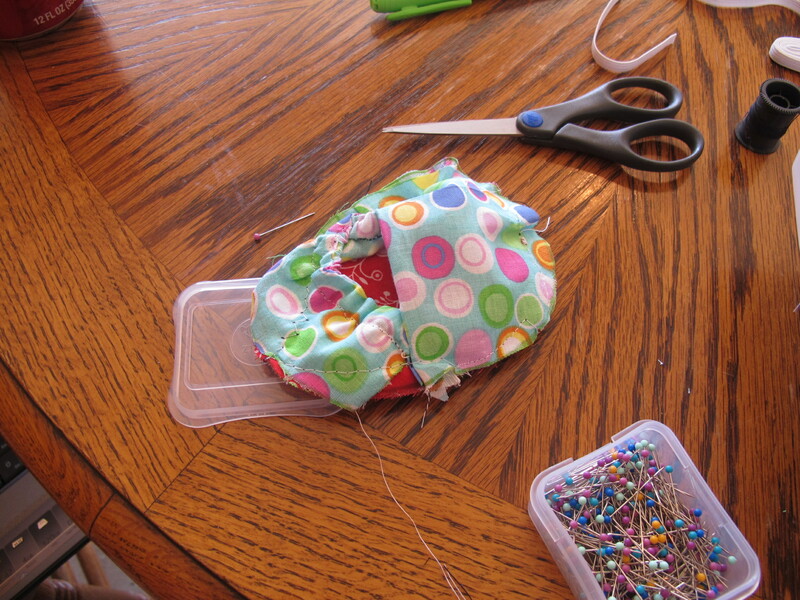 I do have a confession to make though….I haven’t sewn since my sixth grade home economics class. That was by hand and I made one pillow. I have never used a sewing machine. Luckily, my aunt is coming down to visit and she is a sewing genius, so I guess I will have to have her show me the ropes. As I do these projects, I will post the tutorials and the outcome of my project. I’m excited, excited, excited! Ryker is 1 years old!